Otavalo: This is a city located just 20 minutes north of San Pablito de Agualongo. It is famous for its market, "Plaza de los Ponchos", which functions every day in the city’s center. 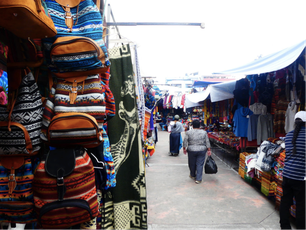 It is one of Ecuador's most popular destinations to buy artisanal goods. 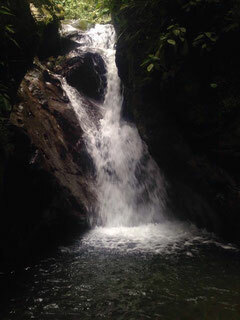 You can also check out the Waterfalls of Peguche, located just 3km outside of Otavalo. 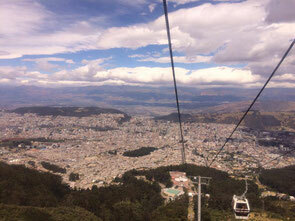 Quito: This is the capital city of Ecuador, located just one hour south of San Pablito de Agualongo. There are several attractions to see here including the city's historical center, museums, parks, and the nearby mountain (Ruku Pichincha), reachable via cable car. With Quito's close proximity, it is well worth the visit. "La Mitad del Mundo" (The Middle of the World): Take advantage of our location and visit the Equator, located just outside of Quito. 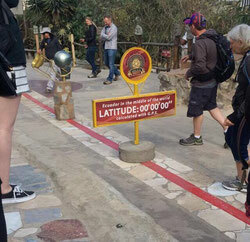 Being at 00"00"00", this location has many attractions like putting one foot in the northern hemisphere, and the other in the southern hemisphere. It is a great place for taking photos! Lakes and Lagoons: Ecuador and the Andean region are also full of lakes and lagoons, which allow for great views and fabulous landscapes. 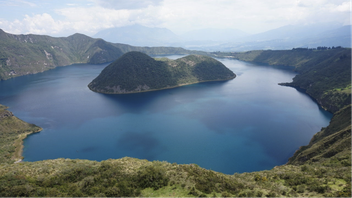 Some examples include the Mojanda Lagoon, Cuicocha Lagoon, Yahuarcocha Lake, and San Pablo Lake. Mindo: This small town is located in Pichincha's Cloud Forest (just two hours west of Quito). Not only will it surprise you by its lush and luxuriant vegetation, but also because of its waterfalls and thermal waters. Condor Park: At Condor Park you can observe different bird species from across the country including the Great Condor, a legendary figure of the Andean Mountains. There are several other places and attractions to visit including the Cochasqui ruins, the cities of Tabacundo and Cayambe, and the Cayambe volcano. Our volunteers have travelled all throughout Ecuador to explore its diversity and to see its marvelous places and incredible views. In eastern Ecuador, you can adventure in the Amazon forest. In the mountains (also known as the “Sierra”) you can hike along the region´s numerous volcanoes, which are among the highest in the world. Finally, you can head to the coast in western Ecuador for some rest and relaxation under the sun. There is also the possibility of exploring the famous Galapagos Islands! With so many things to do, you will have to get ready each weekend to discover and enjoy the riches of this country!